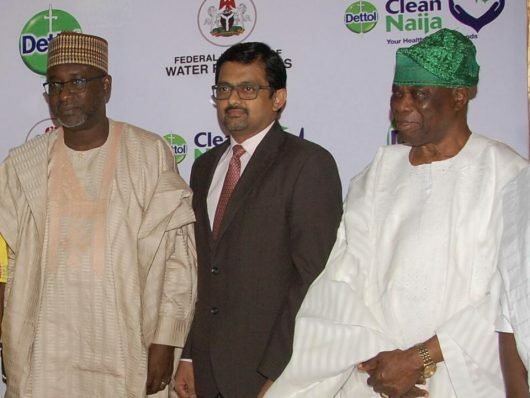 Reckitt Benckiser (RB) Nigeria, makers of leading Antiseptic brand, Dettol and the Federal Ministry of Water Resources have signed a Memorandum of Understanding to partner on a national campaign to achieve a cleaner and healthier Nigeria. The MoU for the campaign tagged the ‘Clean Naija Initiative’ was signed in Abuja on Thursday. The signing ceremony which was attended by the Minister of Water Resources, Engineer Suleiman Hussein Adamu alongside other top officials of the Ministry, also had in attendance the leadership team of RB Nigeria, health professionals and members of the press. It would be recalled that recent reports have placed Nigeria amongst the top nations that bear a significant portion of the global disease burden and high under-5 mortality rates. Many of these diseases, such as diarrhoea can be prevented by proper hand washing habits and wide scale hygiene education. This is a major motivation for the setting up of the Clean Naija Initiative. Speaking earlier, Mr Dayanand Sriram, General Manager, RB West Africa, said the Clean Naija Initiative was developed as an all-inclusive campaign with various levels and phases aimed at creating awareness, education and driving behavioural change to achieve a cleaner and healthier Nigeria. He added that RB Nigeria, through the Dettol brand, has over the years developed a number of programmes committed to tackling public health and hygiene issues. He said some of the programmes included: The School Hygiene Program, through which RB has educated over seven million children on proper hand hygiene habits, and the New Mum’s Program, through which the company has educated over five million pregnant and new mothers on hygienic practices to protect them during the pre- and post- phases of their pregnancies. This is welcomed development. I want to also appeal that efforts should be made to providing water for schools especially for rural areas. As I write, am in a village in called Ibo community where school children as well as adults drink and bath water from the river. Please the ministry and other relevant agencies should help these Nigerians. Children here are always attacked by one ailment or the other. Thanks.